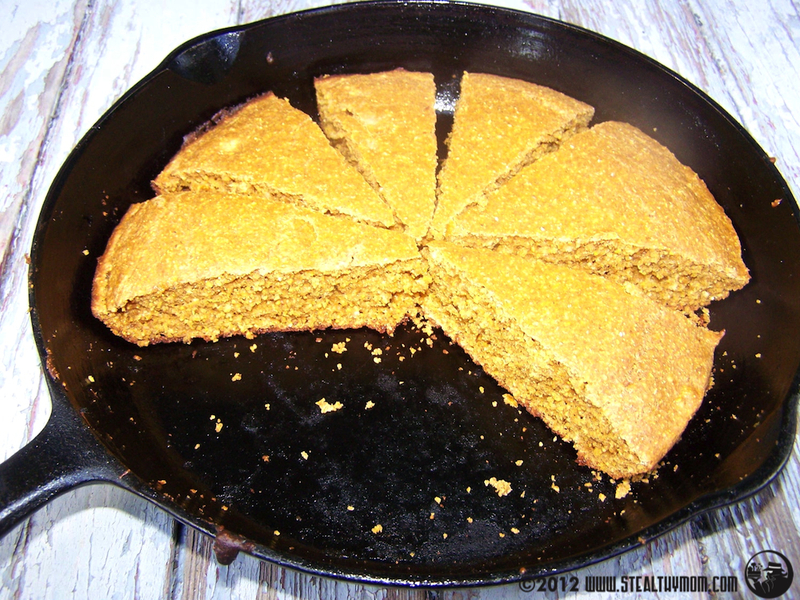 Corn Bread is a perfect compliment to just about any entree cooked on a grill and makes good use of that time when coals are hot. All you need is a good, solid cast iron pan to keep the bread from burning on the bottom. If your covered grill happens to have a thermometer, you will find that handy, too. The trickiest part is to keep your family from eating it all before the rest of your meal is cooked. Corn Bread mixes generally contain too much white flour for our taste. This recipe started as the corn muffin recipe from the Five Roses Cookbook but you might not recognize it. A good ratio of whole wheat flour and non-GMO cornmeal makes the bread tender and a little bit gritty. Molasses lightly sweetens the mix and gives depth to the flavour. When made on the grill it takes on a subtle smokiness, too. Start the charcoal. (If you are using a gas grill, skip ahead.) Slather a cast iron skillet or pan with a generous layer of coconut oil. Mix the dry ingredients together. In another bowl whisk the milk, eggs and molasses. Add the liquid to the dry ingredients and stir well. Pour the batter into the pan and let it soak until the grill is ready. When the coals are ashy, spread them out and put the lid down on your grill. (If you are using gas, start it up and put the lid down for a couple of minutes once it is safe to do so.) Leave the lid down long enough to heat up the inside of the grill. Place the pan onto the grill and close the lid. If your grill has a thermometer, note how hot it gets inside. You will want to modify the cooking time according to this: About 15 minutes for 400F, and about 20 minutes for 375F. Keep the lid down as much as possible. When a skewer comes out clean your Whole Wheat Corn Bread is done. I shared this post with Full Plate Thursday. A good cornmeal sure makes better corn bread. We eat a lot of corn bread and your recipe looks great! Thank you so much for sharing with Full Plate Thursday and have a great week!